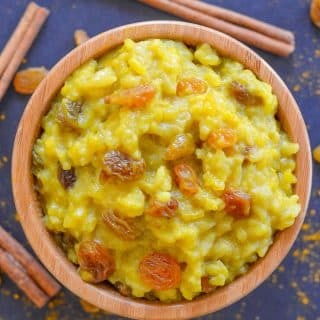 Fragrant, rich & deliciously creamy Slow Cooker Rice Pudding with Turmeric & Cinnamon. It’s like golden milk but in dessert form & it will soothe & warm you right through to the soul! (If you don’t have a slow cooker you can make it on the stove top instead). I’m not usually a milky drink kind of girl, but I do enjoy the odd mug of gently warmed, turmeric infused, homemade almond milk from time to time. It’s such a soothing and comforting brew and it’s sunny appearance is a real mood lifter. This wonderful libation was my inspiration for this Slow Cooker Rice Pudding with Turmeric & Cinnamon. I’ve wanted to try making rice pudding in the slow cooker for a long while and although old fashioned plain rice pudding is wonderful, I always like to put a little twist on my recipes, hence it’s transformation into a somewhat beautiful, Golden Rice Pudding. 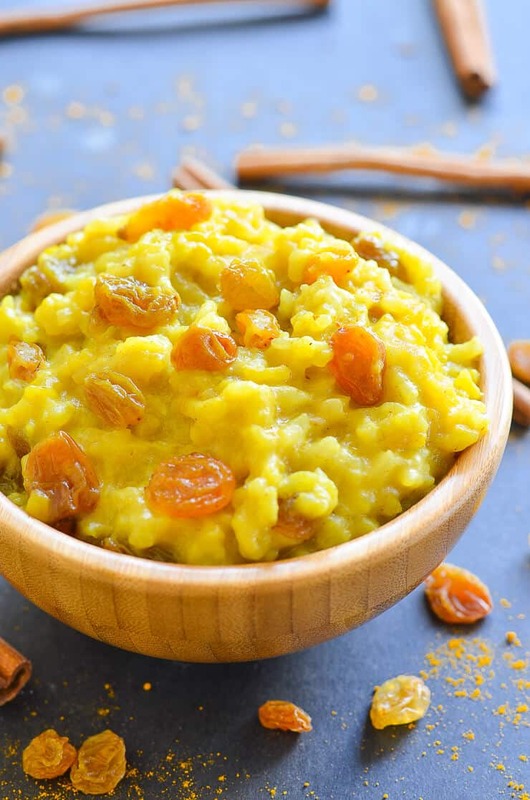 I don’t think you can get a much cozier dessert than rice pudding, except perhaps when you add warming, aromatic and golden turmeric, woody, spicy cinnamon and plump juicy golden raisins. 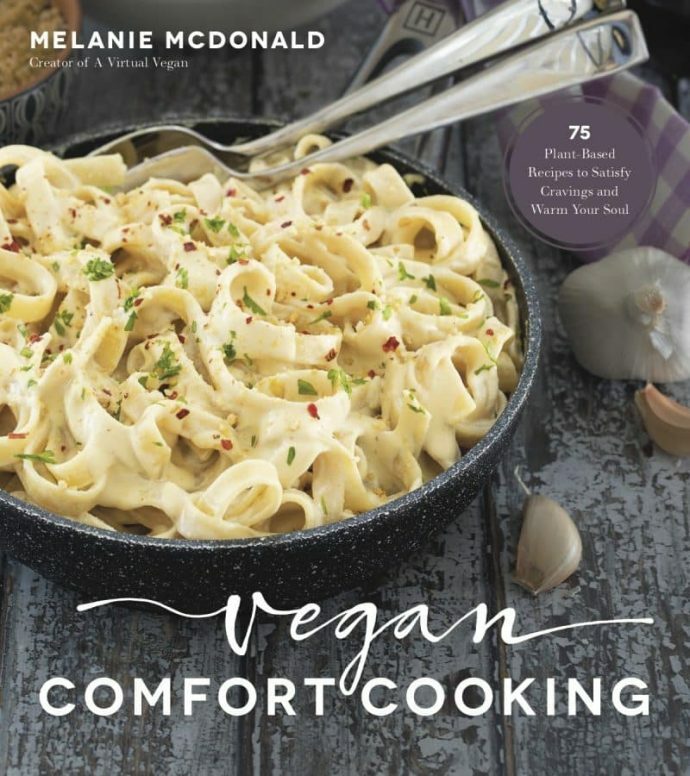 They take you into soothing, comfort food overload. In this recipe, short grain rice is simmered slowly with these fragrant ingredients until it is rich, golden and deliciously creamy. Served warm, it is such a comforting, soothing dessert and one that you will want to make time and time again. For the very best, creamy, soft texture, short grain rice is essential when making rice pudding. When choosing, check the appearance of the grains. They should be small, plump and almost round. When I lived in England, pudding rice was a variety widely available and that is perfect for this recipe. Here in Canada I have had some problems finding pudding rice. I did find some labelled as ‘Sweet Rice’ once and it looked the same as pudding rice with really short round grains. Unfortunately I haven’t seen it again since. Because of this I tend to either buy this one from Amazon, or I buy risotto rice such as Arborio, Carnaroli or Vialone Nano. You should be able to find one of those in almost all grocery stores. Any of them will make a great rice pudding. This Rice Pudding couldn’t be easier to make. Simply put all of the ingredients (except the golden raisins) into a slow cooker, turn to low and simmer away for three hours. Give it a little stir and add the golden raisins about ten minutes before you want to tuck in. They don’t need long to soften and plump up beautifully. AND IF YOU DON’T HAVE A SLOW COOKER? Put all of the ingredients (except the golden raisins), into a pan and simmer gently on the stove, stirring occasionally until the rice is soft and the pudding is creamy. The raisins need to be added in the last ten minutes of cooking time. 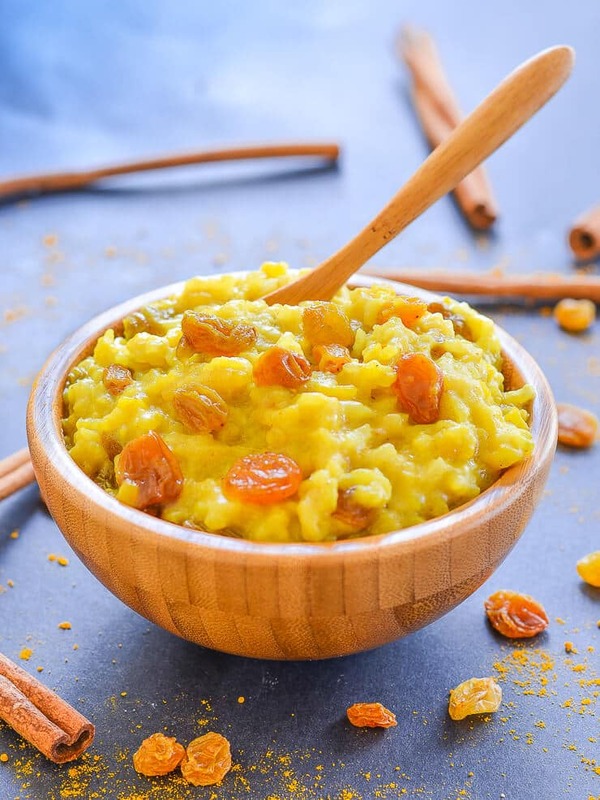 I can’t wait for you try this Slow Cooker Rice Pudding with Turmeric & Cinnamon! When you do, be a ☆ and leave a comment below or share a picture on Instagram. I am @avirtualvegan. Add the hashtag #avirtualvegan to be sure I don’t miss them. 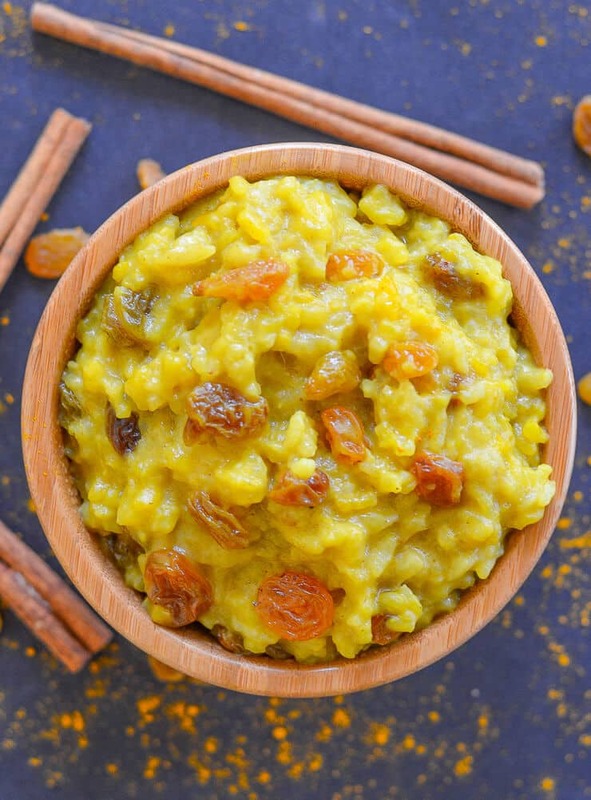 Fragrant, rich & deliciously creamy Slow Cooker Rice Pudding with Turmeric & Cinnamon. It's like golden milk but in dessert form & it will soothe & warm you right through to the soul! (If you don't have a slow cooker you can make it on the stove top instead). IN A SLOW COOKER: Add all ingredients except the raisins to a slow cooker, stir, cover, then turn to low and cook for around 3 hours. As all slow cookers vary slightly in temperature, make sure that you are around for the last 30 minutes the first time you make it, just in case it's ready a little quicker. You will know when it's ready because it will be thick, rich and puddingy. Add the raisins and allow it to cook for 5 - 10 minutes more so they soften then serve. ON THE STOVE TOP: Add all of the ingredients except the raisins to a pan and simmer on a medium-low heat, stirring every 5 minutes or so until the rice is soft and the pudding is thick, rich and creamy. Add the raisins and allow it to cook for 5 - 10 minutes more so they soften then serve. The rice you use must be pudding rice or short grain rice. Look for grains that are plump and roundish. Any labelled as pudding rice will be fine, as will those labelled as risotto rice such as Arborio, Carnaroli or Vialone Nano. This rice pudding will keep for 3 - 4 days in the fridge and can be warmed up gently again on the stove or in a microwave before serving. just wondering, on your golden mild rice pudding (which i am making the second i hear back from you!) do you just throw in the cinnamon stick or grind it first. sounds like a silly question, but it’s serious. lol. i’ve never cooked with a cinnamon stick before. thanks!! You literally just throw it in, then pick it out just before serving. Enjoy! What size crock do you use? I have the DUO Plus Instant Pot with the slow cooker option. Do you have instructions for making this recipe with this Instant Pot? I didn’t have an instant pot when I created this recipe. I am sure it would work but I’m not sure on the best setting or timings. Mine is pretty new and I haven’t attempted a rice pudding in it yet. If you are ok with using the slow cooker function (which I still haven’t tried with my Instant Pot) then I would imagine it will work as per my instructions. With any other setting it will be a case of experimenting. 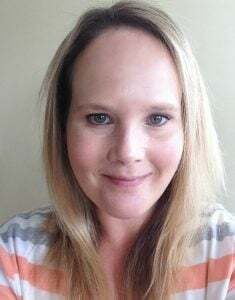 As soon as I get a chance I will try it myself and update the post, or create a new one specific to the Instant Pot. I hope that helps a bit! Oh and my slow cooker was a 6 quart so the size will be fine. Hi! This looks delectable, and I think it will be delicious. Before I set out though, will you please confirm the total liquid volume? Is it actually a total 0f 1150 ml for one cup of rice? Want to be sure so that I don’t end up making rice ‘soup’! Thanks much for a clever way to get more turmeric : ) . Thank you Lesli! ???? Yes the liquid quantity is correct. I just double checked my recipe notes in case I had made a mistake. You wont have rice soup! It doesn’t end up runny at all. It will be a perfect rice pudding consistency. Short grain rice is much starchier and tends to absorb more liquid than long grain rice, hence the amounts. I hope you enjoy it! I’m amazed I’ve never seen turmeric in rice pudding before! Such a delicious natural fit. Brilliant as always Mel! Oh my gosh, I LOVE rice pudding! My mom used to make it at least once a week. It was one of my favorite treats. 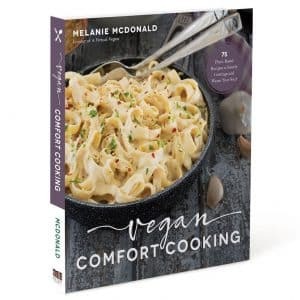 This looks amazing, Melanie. I’m loving the addition of turmeric. Thank you Linda. My Mum used to make it all the time too. With nutmeg on it. It was so good! There is so much turmeric buzz and you’ve brought in an inventive recipe with this one, Mel! Nicely done pairing with such a timeless comfort food like rice pudding. Thank you Dreena! Turmeric certainly deserves all the buzz and it works so well in this pudding. This slow cooker pudding looks like such comfort food!!! Love that gorgeous colour too! I love how turmeric gives such a great yellow color to things!! Wish I liked the flavor more, I love colorful food!! It’s so pretty! Thanks Sophia. The world would be a boring place if we all liked the same things. At least you can enjoy its colour if not it’s taste! Wow, I’m loving that vibrant yellow color from the turmeric! This looks delicious, Mel! I’ve actually never made rice pudding! I’m trying to add more turmeric into my diet though, so this would be a good recipe to start with! Really? I can’t believe that! You should totally try it, especially as you are upping your turmeric game. ???? Sounds so warm and cozy! I love turmeric. This would be a delicious bedtime snack! Thank you! It has been a delicious evening snack here for a couple of weeks now. I keep making it over and over! I’m gonna try to make this later but I don’t have cinnamon stick. Can i sub it with cinnamon powder instead? If so, how much should I add? Thanks! I think I’d start with 3/4 teaspoon then taste it when its nearly ready and add a little more if you think it needs it. I wouldn’t think you’d need more than 1 teaspoon though. Hope you enjoy it!